Janeite Sarah Frantz, who blogs at Teach Me Tonight, sent us a Tweet featuring a photo of her latest tattoo, which made us gasp at its brilliance. She gave us permission to share the photo on AustenBlog. It is the words “agony” and “hope” in the Jane Austen handwriting font opposing one another…half agony, half hope. 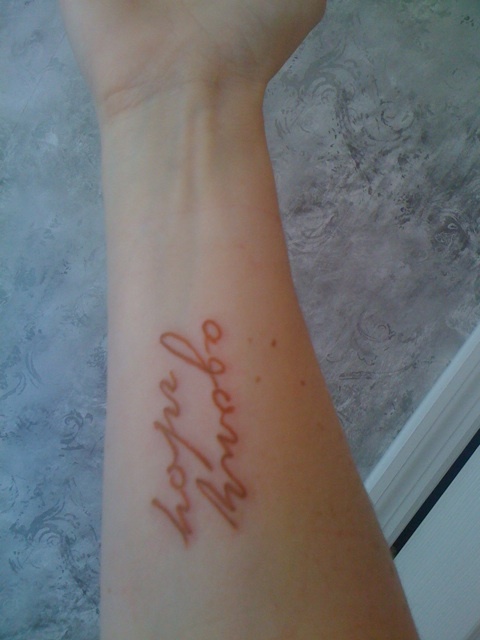 While we admire tattoos on others (and know of several people with Austen-related tattoos), we have never really been moved to want one of our own; but this is the first that made us absolutely envious. Conception, design, and execution are all brilliant. I love it! I’ve gotten more than a few friends to read JA for the first time by reading that letter to them. Amazing!!! I’ve always wanted a tattoo but could never figure out what I’d like…ideas are percolating!